If you’ve ever tried to dress a small child, more than likely you’ve dealt with wriggly little feet that didn’t want to be stuffed down into shoes. 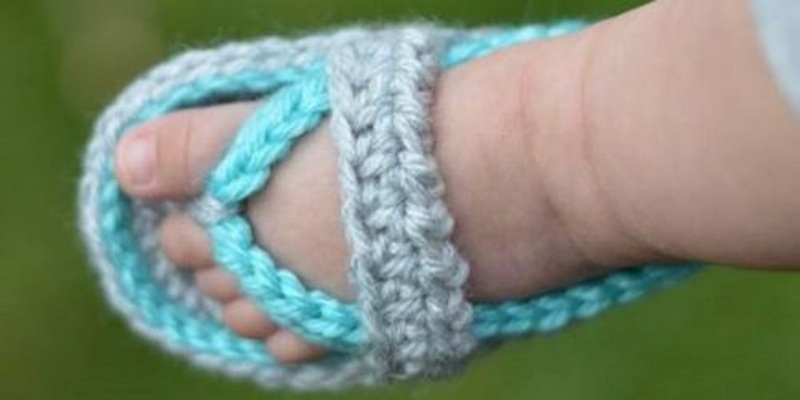 Socks can sometimes be a challenge as well – which is why Whistle & Ivy’s “Crochet Baby Strap Flip-Flop Sandals” are a great item to have in a baby’s wardrobe, as they let tiny toes breathe but keep them warm and safe too! These darling slippers, perfect for both spring and summer, are easy to customize in both size and color, and work well for all babies, size 0-12 months. A PDF pattern is available for sale but the instructions are free on the website, in sizes 0-3, 3-6, 6-9 and 9-12 month.If you’re more comfortable watching someone over reading the pattern, there is a video tutorial available (the link is included on the instructions) for the slippers in 3-6 month size. You’ll need the standard tools (a medium-weight yarn, an “F” size hook and a yarn needle) and you’ll need to know a few basic stitches, including slip stitch, double crochet and half double crochet. It should be noted that the pattern uses American terms. After you’re done making a pair (or two), you can easily show off your creation via Whistle & Ivy’s Facebook group or tag the photo on Instagram. It’s always fun to connect and see how others added their own twist to the pattern. Who knows, you may get inspiration for your next pair! The pattern for these cute, easy-to-make sandals can be found at the Whistle & Ivy’s website (click here).